The UK continues to suffer political trouble since the last election, where Prime Minister Theresa May’s Conservative Party fell short of an outright majority in the Parliament and is being forced to govern a minority government with the support from Ireland’s Democratic Unionist Party. In November last year, a report surfaced that several Party members, as many as 40 MPs were trying to oust her by gather. A previous plot in September ultimately failed but reminds that such trouble would be a regular affair in a minority government, which lost the majority over Mrs. May’s gamble with a snap election. Earlier this year, several of her Brexit ministers have submitted resignation including foreign secretary Boris Johnson, Brexit Secretary David Davis in protest to her Brexit plan and since then, the protest has increased significantly within the party. More resignation followed once Prime Minister May revealed her Brexit deal with the EU, which has been cleared by EU leaders. The Prime Minister was forced to cancel voting on the agreement after it was clear that it would suffer a huge defeat. The deal was finally tabled for voting earlier this month and as expected it was defeated by a huge margin. However, Prime Minister May’s government survived a no-confidence motion tabled by opposition Labour Party leader Jeremy Corbyn. Moreover, the time is running out for the Brexit negotiations, which needs to be completed before March 2019. More negotiations would follow, as the UK parliament rejected the recently agreed deal. However, the EU has been insistent that the agreement is not up for negotiations. Several economic dockets released recently shows that the UK economy might finally be losing some steam, especially the housing sector. In 2017, the first quarter GDP growth was much weaker at just 0.2 percent q/q, much lower than other European peers. Though it recovered marginally to 0.3 percent q/q in the second. On a yearly basis, the economy grew by just 1.7 percent in the third quarter, which is the lowest reading since 2014. GDP growth has declined further in the fourth quarter to 1.5 percent y/y. GDP growth has slowed further to 1.2 percent y/y in the first quarter of 2018. However, in the second quarter, GDP growth was higher at 1.3 percent y/y. Growth rate recovered slightly to 1.5 percent in the third quarter, only to fall in the fourth. Bank of England’s (BOE) inflation report forecasted tightening of inflation. It is very important to keep on assessing the economic well-being to understand the impact of this ‘first-time-ever’ event. The recent data showed inflation declined to 1.8 percent y/y in January. One of the key measures of economic wellbeing is the unemployment report, which will be released from the United Kingdom today at 9:30 GMT. The reports released so far have shown no devastating impact from the Brexit referendum outcome. For today, the expectations are similar. As of now, the unemployment rate in the UK stands at 4 percent and median estimate suggests it is likely to remain the same. So, the major focus will be on earnings growth, since that will be the measure of economic wellbeing. 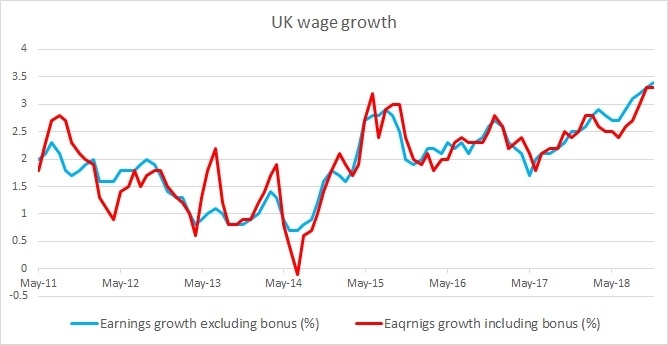 Moreover, positive wage growth should help to downsize the fear of a slowdown in the economy heading towards Brexit negotiations. It will be nice evidence that companies are ready to increase wages even in the face of an exit from the European Union. BoE governor Carney said that the central bank would be monitoring the level of income closely, especially since the referendum aftermath upbeat economic performance was due to consumer spending and credit. Income levels directly affect these two components. Recently, there has been some weakness in the economic dockets such as the housing reports and the PMI reports. So, the market participants would be closely watching whether the earnings report reflect the same or not. After declining since October 2015 from 2.8 percent, wage growth has dropped to just 1.8 in February 2016 but recovered since then. After peaking in November 2016 around 2.8 percent, earnings growth have started slowing down once more. It has been edging higher again since bottoming last summer and reached 2.9 percent growth in the first quarter. The last report has shown a rise to 3.4 percent. See chart. Today earnings growth is expected to be at 3.4 percent excluding bonus, and by 3.5 percent including it. The pound is currently trading at 1.29 against the USD and likely to move higher if the report turns out to be better. However, the broader bias still remains to the downside.